A chef of molecular gastronomy, a master butcher and a designer have teamed up to look into sausage production techniques to reinvent the sausage of the future. Photo credit: Collage deconstructing a mortadella on a back-ground of a macro image of broccoli, alongside the traditional pork, also broccoli, carrots, romanesco, cauliflower and pistachio nuts, by Emile Barret. Can the sausage be a solution to reduce the consumption of meat and to increase the diversity of our diet? Can it make a considerable contribution to a sustainable food culture? To answer these questions, product designer Carolien Niebling has collaborated with a chef of molecular gastronomy and a master butcher to challenge traditional sausage production techniques, one of mankind’s first-ever designed food items, and experiment with new ingredients – like insects, nuts and legumes, to reinvent the sausage of the future. Join us to experience The Sausage of the Future with Carolien Niebling at WantedDesign Brooklyn, Industry City, opening on May 16th and until May 21st, 2018. 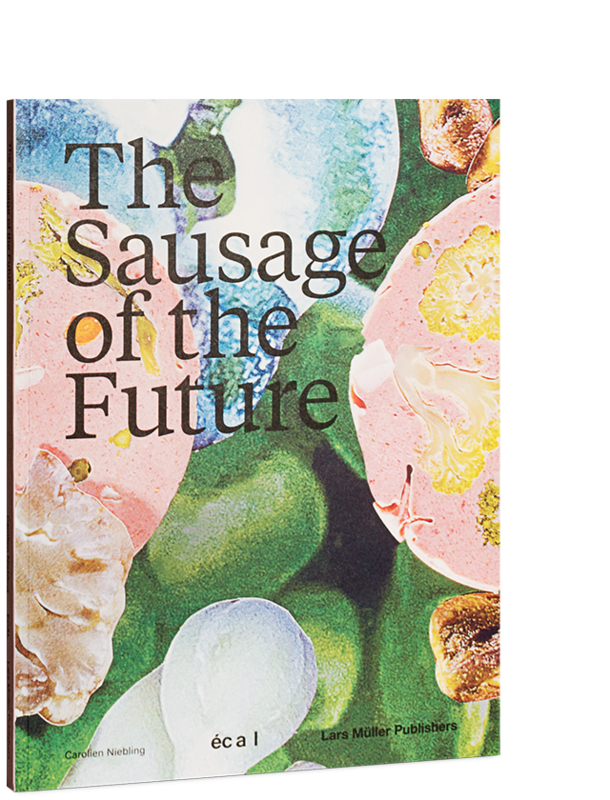 Come visit the exhibition booth to take look at The Sausage of the Future book, enjoy daily sausage tastings with our butcher shop partner The Meat Hook from Brooklyn and attend our talks! Carolien Niebling, born 1984, is a designer and researcher who specializes in food-related projects and lives and works in Lausanne, Switzerland. Graduated from ECAL Master in Product Design in 2014, Niebling is the winner of the Grand Prix Design Parade at Villa Noailles, Hyères and the Hublot Design Prize, 2017. She has been working on The Future of the Sausage research project with the expertise of butcher Herman Ter Weele from Oene, Netherlands and chef Gabriel Serero from Lausanne, Switzerland, to create a series of innovative sausages and explore the sausage as an edible designed object. Presented by the Consulate General of Switzerland in New York and swissnex in New York. Supported by The Meat Hook, our butcher shop partner in Brooklyn and Vitra Inc.
A research project conducted at ECAL / Ecole cantonale d’art de Lausanne and published by Lars Müller Publishers. Experience the Sausage of the Future with us! Join award-winning product designer Carolien Niebling and Brent Young, butcher and co-owner of The Meat Hook for a conversation on sausage making, challenging traditional production techniques and exploring new ingredients like insects, nuts and legumes to create the sausage of the future. The conversation, moderated by Emilie Baltz, will be followed by a tasting with sausages specially produced by Niebling and Young for their collaboration at the WantedDesign fair. Join us for a conversation between Carolien Niebling and Stefani Bardin, Professor at the Graduate Food Studies Program at NYU and at Parsons The New School For Design. Followed by a Sausage Tasting. Brooklyn, NY 11232. Store hours: Tuesday-Sunday, 11am-5pm.